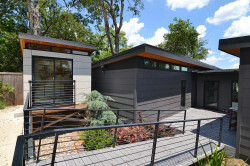 The most exciting sites emerging for modern homes in Dallas are on East Lake Highlands Drive that overlook White Rock Lake and the forest and bicycling paths of White Rock Lake Park. This is the location of the modern home at 9211 East Lake Highlands Drive designed by a Seattle architect in collaboration with Dallas designers and contractors. 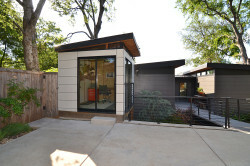 Kessler Woods and Urban Reserve are successful modern home enclave developments, but East Lake Highlands Drive has spontaneously attracted modern homes and become the site of choice for award-winning architects who understand a great modern home needs a great site and the East Lake Highlands Drive site is spectacular. 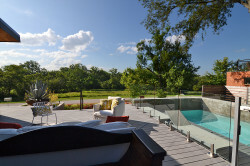 At 9211 East Lake Highlands Drive the views from the home elevated high off the lake, either from the terrace and pool or through the interior windows, are of abundant nature punctuated by the intermittent streams of joyful cyclists riding around White Rock Lake. East Lake Highlands Drive is a favorite neighborhood leg of the ride that provides natural and architectural delights. The design of this modern home at 9211 East Lake Highlands Drive is propelled by the advanced materials, technology and construction techniques, and aesthetics of architect Ryan Grey Smith, along with the homeowner who has a strong background in art and design, contractor Steve Tortolani who combines artistry and precision, lighting designer Suzanne Branch who used Lutron as the medium for her design, and trained architect and architectural designer Chase Corker who intimately knows this environment as his own home is on the street. Architect Ryan Grey Smith created the engineering, construction and design of Modern-Shed to create delightful superior structures that are small and utilitarian in nature. In Dallas his deft eye is evident as he was able to capture the sunlight and efficiency of his small structures and at the same time enlarge the concept to create a prominent home located by White Rock Lake. This modern home is expanded by glowing sunlight and outdoor living spaces that are beautifully integrated into the plan of the home. 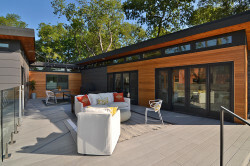 The engineering and quality of construction of Modern-Shed is combined with an even more refined design resulting in this exalted home at White Rock Lake. Distinct living spaces of this contemporary home are created in part by terraced stone steps, foot bridges, courtyard terraces, and a pool. Yet each of these desirable spaces become visually interlocked and inviting to explore. The floor plan and materials provide warm private spaces and continuous open spaces. The sloped lightly stained ceiling glows from the morning sun that streams in through the high clerestory windows. Even in the summer when the sun is in its highest position, sunlight streams across the home. In the winter, with the sun low on the horizon, streaks of sun travel clear across the polished and stained concrete floor. Natural light links the interior and exterior spaces. Chase Corker is a trained architect and architectural designer who designed on the dramatic slope of the site a modern approach to the classical step procession from the front lawn to the entrance of the home. He also designed the hardscaping and exterior terraces, linking the home to the pool and courtyard and the bridge to the separate office. Steve Tortolani of Ikon Residential is a residential builder and contractor who specializes in Dallas’ favorite and emerging neighborhoods that relate to downtown Dallas. 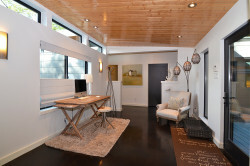 At 9211 East Lake Highlands Drive he worked with quality components manufactured in Seattle and then sourced and created materials that would make the home even more green, technologically efficient and structurally superior. The quality of construction is seen in the foundation. Steve Tortolani had the piers of the pier and beam foundation drilled over 20 feet to rock. 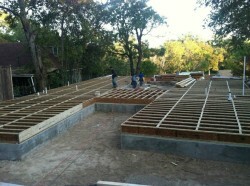 The foundation platform begins with a greater frequency of supporting joists than most homes. A layered system below the floor consists of tongue-and-groove AdvanTech, screwed in Hardie board, and lath and mesh is the immediate base for the micro thin self-leveling composite polymer concrete stained polished floors. 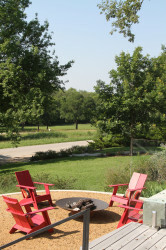 Steve Tortolani also designed and created the street bridge that links the home to the carport and home office. Another one of my favorite parts of the home is the bowed terrace of the decomposed granite that overlooks White Rock Lake Park. Many multi-million dollar homes do not have the quality found in this modern home. The abundant natural light that streams in the home is further enhanced by the lighting design created by lighting designer Suzanne Branch and controlled by a Lutron lighting system. The modern hardware found in the home is custom made by Emtek. There are custom Milgard metal windows with screens and there are windows that are sliding doors that open to courtyards and to terraces made by Chase Corker. A sleek richness is projected in this contemporary home, from the stained and polished composite concrete floors to the stone slab countertops in the kitchen and bathrooms made of organic white cornerstone quartz. The stone and wood finishes and the precision of the construction give the home a substantial presence. The steeply sloping land and rugged terrain required the home to be firmly embedded into the site. Perched above the street, the massing of windows and the series of wide, sliding doors to the outdoor living spaces brings a sense of lightness to the structure. 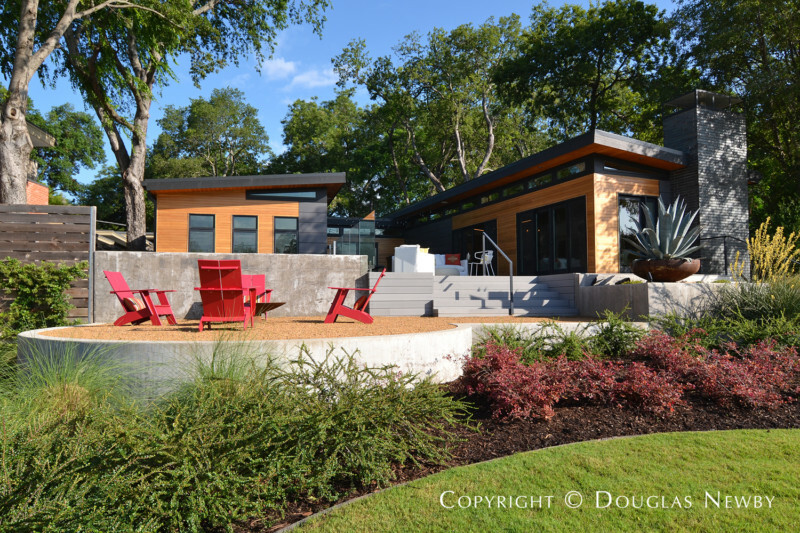 Along with the aesthetic achievement of this collaboration of architects, designers and contractors, the real estate value of this home cannot be duplicated with new construction on East Lake Highlands Drive, across from White Rock Lake and Park. The current cost of the land, which is increasingly difficult to find here, and the cost of construction would exceed the price for which you are able to purchase this architecturally significant home. In addition, you will enjoy the ability to move in quickly and immediately enjoy the neighborhood and the lake versus the customary two year period it often takes to design and build a home. Many modern homes are admired. This modern home resonates with the public in ways few other homes have. The size is approachable and its architectural presence magnificent. Realtor Douglas Newby has enjoyed White Rock Lake for years and often on a daily basis, and shares your passion for a beautiful environment close to downtown Dallas. Douglas Newby has also seen, sold and written about many of the best architecturally significant modern homes in Dallas. Contact Douglas Newby to share your thoughts and to see if he should represent you in finding a modern home.